STUNNING 180 GRAM VINYL REISSUE OF HATE FORESTS 2001 ALBUM! 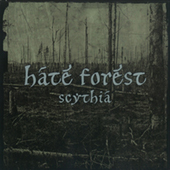 Hate Forest was a Ukrainian black metal band formed by Roman Saenko, the leading member of Drudkh, Dark Ages, and Blood of Kingu. Thurios joined the band in 1998 after the recording of "Scythia". The music is mostly very fast, but occasionally also slow, with low, distorted vocals and dark ambient elements (some releases have consisted entirely of dark ambient tracks). The band never gave interviews, never released photos, and held their distance from the black metal scene. After Hate Forest disbanded, Saenko focused on Blood of Kingu, a band similar in style but of different inspiration. 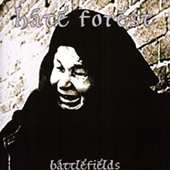 STUNNING 180 GRAM VINYL REISSUE OF HATE FORESTS 1999 ALBUM! 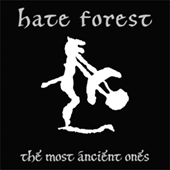 Hate Forest was a Ukrainian black metal band formed by Roman Saenko, the leading member of Drudkh, Dark Ages, and Blood of Kingu. Thurios joined the band in 1998 after the recording of "Scythia". The music is mostly very fast, but occasionally also slow, with low, distorted vocals and dark ambient elements (some releases have consisted entirely of dark ambient tracks). 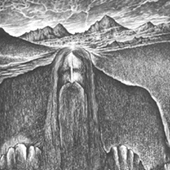 The band never gave interviews, never released photos, and held their distance from the black metal scene. After Hate Forest disbanded, Saenko focused on Blood of Kingu, a band similar in style but of different inspiration. 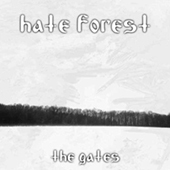 STUNNING 180 GRAM VINYL REISSUE OF HATE FORESTS 2003 ALBUM! 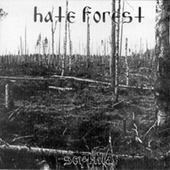 Hate Forest was a Ukrainian black metal band formed by Roman Saenko, the leading member of Drudkh, Dark Ages, and Blood of Kingu. Thurios joined the band in 1998 after the recording of "Scythia". The music is mostly very fast, but occasionally also slow, with low, distorted vocals and dark ambient elements (some releases have consisted entirely of dark ambient tracks). The band never gave interviews, never released photos, and held their distance from the black metal scene. After Hate Forest disbanded, Saenko focused on Blood of Kingu, a band similar in style but of different inspiration.